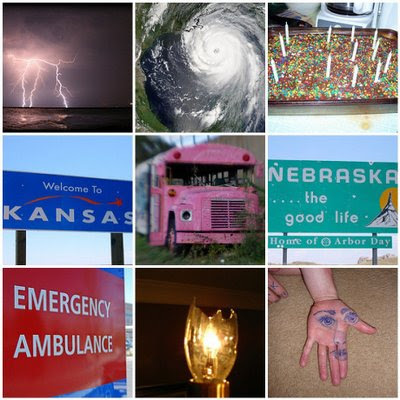 I grew up in an agricultural county and even though I was a "townie" I was still active in 4H completing woodworking, photography, electrical and cooking projects. I even won an outstanding rating for my snickerdoodles one year. My mom served as the assistant 4H agent in Ashland County and ran the Junior Fair for several years. Needless to say I was very involved, serving on the Junior Fair Board for a number of years and practically living at the county fair for one week each year. I told someone on the bus to Boston last week that the county fair was our Face Book back in the day. I have great memories of those times and think about them often. When I read The Beef Princess of Practical County, I was transported back to the Ashland County Fair. As I read, I knew that the author had to be someone who shared a similar background, it was all too accurate for someone who had not experienced growing up in an farming community to write. I was pleasantly surprised when I read about author Michelle Houts at the end, I had no idea how similar our backgrounds are! She also attended THE Ohio State University (Go Bucks!) graduating in education and currently lives on a farm raising grain, and livestock. I knew she knew what she was writing about. The story takes place in Nowhere, Indiana where the farmers are known for their beef cattle. The Practical County Fair is held once a year in Nowhere and the families all compete for the title of Grand Champion, it's a real point of pride in farming communities everywhere, and Practical County is no exception. Libby Ryan has grown up around Ryansmeade Farm, and represents the fourth generation of Ryans to grow up on the farm. Michelle Houts chose to begin with Libby just about to lead her steer into the auction sale at the end of the fair, a tradition that you really should experience, and then flashback to the year that lead up to it. We are introduced to Libby and family as she goes to her grandfather's pasture to select her calves to raise for the fair. We follow the family through the year keeping progress on the calves and their growth, and the relationship between Libby and her father. Her father isn't sure that Libby is cut out for raising beef cattle and he misses his only son who is in his first year at Purdue. In addition to raising the cattle, Libby must put up with a precocious little sister who has "grandchildren" as imaginary friends, and the Darling family. Three sisters named Precious, Lil and the youngest Ohma Darling, the older two have dominated the Beef Princess title for three years running and look to win it again. Before you laugh, these title are serious in farming towns and highly competitive. Typically more than a beauty pageant, the girls are quizzed on their knowledge of the animal and the industry, as well as poise. In this case, however, the Darlings seem to be winning on their looks more than anything. I knew families like the Darlings whose animals never won and who eventually succumbed to the embarrassment and cheated. The author does a fantastic job of describing the events that lead up to the downfall of the Darlings. Libby learns that she loves everything about the beef industry except for the end result. She has horrible feelings of loss as the day of the auction grows nearer and even declares herself a vegetarian in support of her animals. It leads to a hilarious exchange between Libby and her best friend Carol Ann, my favorite character, in which Carol Ann tries to nail down just what kind of vegetarian Libby is. I didn't know there were so many categories! Libby also learns that she is not cut out to be the Beef Princess of Practical County when her mother encourages her to enter the competition. It's a fascinating plot watching Libby go from complete refusal of the competition to accepting the challenge to fighting her nerves during the pageant. It's clear the Michelle Houts knows farming, fairs and the competition in the show ring. I loved this book, partly for the walk down memory lane and partly because of the positive portrayal of a dying life style, the small family farmer. I will recommend it to all of my fifth graders both as a good book and as an introduction to a culture they are probably not that familiar with. Most likely the girls will like it more than the boys. This Michelle Houts' first novel, I'm on a roll with first novels this year, and she has a really cool website with scenes from her farm and how to show a steer. I'm leaving for my annual golf trip to Michigan, or as I like to call it Summer Camp for Dads, in the morning and then my summer travels are complete. I suppose I'll have to start to focus a little more on the beginning of the year then. While I was recently in NYC, I stopped by a wonderful children's bookstore called Books of Wonder. While there, Munmun, one of the managers plied me with book after book. By far and away, my favorite was Anything but Typical by Nora Raleigh Baskin. Anything but Typical revolves around the main character, Jason Blake. He is an autistic 12 year old boy, who lives in a neurotypical world (translated, that means people who do not have problems neurologically). He has a mom, a dad, and a younger brother, but this story is not told from their perspective; it is told from Jason's. And since he is autistic, he tries to tell the story in first person (which is the neurotypical way), but sometimes he reverts to talking about himself in third person. As if middle school wasn't difficult enough to navigate, imagine being Jason. The social cues that most people can pick up on are like a foreign language for Jason. He had a special ed aide the previous year that taught him to say, "I am okay just as I am." "Look people in the eye when you are talking (even if this makes it harder for you to listen). Talk, even when you have nothing to say (that's what NTs do all the time). Try to ignore everything else around you (even when those things may be important). If possible put your head and your body back together and try very hard not to shake or flap or twirl or twitch (even if it makes you feel worse to do this)." As you can see, the world he lives in is very confusing for Jason. But, the one place he feels in control is when he composes stories on his computer using a program called Storyboard. This program allows other readers to read stories in progress and comment on them. This is where he meets someone named "PhoenixBird" who loves his most recent story. And, from one of her comments, he realizes that PhoenixBird is a girl. They actually start a correspondence using Storyboard, and they seem to really hit if off with one another. Jason can say things using a keyboard that he would have great difficulty saying verbally. This relationship proceeds, and he even finds out that PhoenixBird has a name. Her name is Rebecca. He rushes home each day, eager to see what message Rebecca might leave for him. All is good until Jason's parents surprise him with a trip to the Storyboard conference in Texas. He may miss some social cues, but he is savvy enough to realize that his computer persona is much different than the one he will present in person. Worse yet, Rebecca will be at the conference, too. Even though he was excited about going to the conference in the beginning, he begins to worry nonstop about it, and hopes somehow he won't have to go. In the end, he goes and both good and disappointing things happen at the conference. Jason doesn't have any friends at school, but there is Aaron Miller, a boy who always has a kind word for Jason and will stand up for him when others make fun of him. When Aaron sees Jason eating alone, he is quick to invite Jason to sit with him. Aaron even listens to a story Jason tells him about (the same one he is writing on Storyboard), and is very generous with his compliments when Jason is done. I couldn't help wishing that more children were as kind and empathetic to students with differences as Aaron was. Other characters of note: Jason's mom who seems to be in a perpetually sad state, Jason's dad who is a dad that just wants the best for his son, and Jeremy, Jason's younger brother. Jeremy stands out for me because even though he is younger, he is both protective and understanding of Jason. Jeremy is the person who comes the closest to being able to make Jason smile. I would have to say that I think Anything but Typical should be a must-read for all teachers. As inclusion becomes more prevalent, it is important for us as teachers to be aware of how difficult the typical school day is for students like Jason. We need to be more empathetic and understanding. Another huge value for Anything but Typical would be to read this aloud with an entire class or encourage a group to read it for a Book Club discussion. The conversations would be amazing, and hopefully enlightening as well. Jason is a character that has gotten under my skin and into my heart, days after I closed the back flap of the book. This book has been out since March, and I can't believe I haven't heard about it before now. It's amazing. I will be forever grateful to Munmun at Books of Wonder for handing me Anything but Typical!!! Franki (A Year of Reading) has done so much thinking and learning about 21st century literacy in the past year since the NCTE convention. That really seemed to be a turning point in her learning and her quest for knowledge. Franki, Mary Lee (A Year of Reading), and Katie (Creative Literacy) came back from the convention and started twittering because they had heard so much about Twitter from people at the convention. In the beginning, it was an opportunity to try out a new technology and see if it had purpose and meaning for them. Now, 8 months later, Twitter has become a way of further investigating ways to weave 21st century literacy into their students' lives. These three ladies convinced me to try Twitter. At first, it was mostly a social thing for me; an opportunity to check in on people's lives in 140 characters or less. Was it necessary? I'm not sure about that, but I did enjoy the quick check-ins. As time went on, I started to add more meaning to Twitter. Many blog friends became members, and using a site called tiny.url, we could convert our blogs to fit the character limit, and start to share out blogs that were meaningful to us. Now I was able to talk about literacy using Twitter. But, this summer, I made an even bigger leap. I started to pay attention to my Twitter friends who would "retweet" (RT) a great tweet that they had read. And, as it turns out, these retweets that I'm following all deal with 21st century literacy in the classroom. It has been an amazing journey of learning and one I've just begun. So today, when Franki asked me to be part of her Twitter meme that shows a mosaic of people who are my Twitter friends that I learn with and from each and every day, I was delighted to do it. So, with no further ado, here are the people who are helping my learning grow. It seems only fitting that since they are the ones that introduced me to Twitter that Katie, Mary Lee, and Franki are the first three Twitter friends in my mosaic. It would be interesting to see how this list changes throughout the next year. I imagine that there are several people who I will want to add to this list as I get more comfortable with Twitter. My oldest daughter and I just got back from a five day trip to NYC. We stayed with a college friend in her studio loft apartment in Chelsea, and we experienced as much of NYC as we could. My oldest is not a shopper, so when I say we experienced it, I mean we walked everywhere, took public transportation whenever possible, and saw a side of NYC that only a New Yorker could share with us. All in all, a fantastic time!! For my over-50 brain, I have written a list on two entire pages in my writer's notebook of all the experiences we had. It's pretty amazing to see it listed that way on paper. However, not to worry. I'm not going to share all my vacation pictures with you, but I would like to highlight some of the "literate " things we managed to do. First of all, the book I took to read on the plane ride there was Also Known as Harper by Ann Haywood Leal. This book has been getting a little buzz lately, especially from my blog partner Bill. I'm not going to re-review it here, but I will say that it is a wonderful book, complex in topic, with much to discuss. I have to say it definitely will be in my pile of possible read alouds for this year. If you haven't read it yet, I highly recommend it! On our second day in NYC, after a delicious dinner in Little Italy, Carol (my NYC friend) and I strolled back to their apartment. On th e way, we passed the school both of her sons had attended in younger days -- P.S. 41. It was fun to see the layout of an NYC elementary school, but also schools like this are the ones I've read about in books by Lucy Calkins and Shelley Harwayne, just to name two amazing literacy leaders. It was fun to imagine them visiting and supervising in a school such as P.S. 41. On the third day, we went to the New York Public Library's main branch. I've heard so much about its children section. Much to my dismay, however, the rest of the library, while absolutely gorgeous to look at, is reference materials only. It was a rainy day, and I was hoping to pull a chair up to one of the beautiful library tables, complete with lamps, and spend some time reading to escape the wet weather. It was not meant to be. On the same day as the visit to the library, we also spent some time at the Metropolitan Museum of Art and Grand Central Station -- both of these buildings are fabulous as well. But, the best part of that day was stopping at Books of Wonder, an independent children's bookstore only 2 blocks from my friend's apartment. I fell in love! There was scaffolding outside as they were working on the exterior of that part of the block, so the outside was not anything to write home about, but as soon as I walked inside the door, I felt an incredible sense of welcoming. The store is bright, full of children's books, organized in a way that is very friendly for any browser. The bookshelves on the perimeter of the store go from floor to ceiling, and those books that are higher can be accessed by a library ladder. The store personnel were incredibly gracious as I explained that I was from Ohio, visiting a friend, and I like to blog about children's books. A special thanks to Munmun who kept finding books for me to check out, and to Ashley for all her kindnesses during checkout. These two lovely ladies are the reasons I love giving my business to independent booksellers. They were smart, knowledgeable, and so willing to help me. In fact, Munmun kept finding and handing books for me the entire time I was there. I just got to sit back and preview books to my heart's delight! I enjoyed all her selections but there was one book that I absolutely loved!!! Look for the review on Sunday. In the end, I left Books of Wonder with way too many books to fit in the luggage that I brought! Shortly after 9/11, Shelley Harwayne came to speak at the Dublin Literacy Conference. She brought sample after sample of the messages and flowers and poems and posters about loved ones that went up all over the city. I was so moved by her stories and her photographs, that I knew whenever I got back to NYC, I would have to visit the site of the World T rade Centers. The actual sites of the "footprints" of the World Trade Centers are just a lot of construction right now, but there is a memorial that we got to see. It lives in St. Paul's chapel, just north of the Wall Street area, and adjacent to where the Trade Centers used to stand. St. Paul's is the place that the rescue workers came to for food and rest after 9/11.Surrounding St. Paul's chapel is a rod iron fence where many posters, stuffed animals, messages were left in memory of those who died that horrific day. Many of these items now reside inside of the chapel. I couldn't contain my emotions while looking at everything -- I found myself quite choked up, tears streaming down my face. But the power of the words I saw were symbols of people's grieving and their love of lost loved ones. These words had a life of their own. I discovered I love Thai food (I'd never had it before). I saw Susan Sarandon cross the street right underneath my bedroom window. My daughter and I stumbled across a movie location shooting for J. Lo's newest movie, and watched her do many takes of one scene. Ran into the Naked Cowboy in his "normal" underwear attire -- turns out he wants to be a write-in candidate for NYC mayor. Who knew?! So the original plan was to read this advance from Barbara O'Connor on the bus to Boston, but I just couldn't wait. Rather than pack and get ready to go, I sat down and finished this gem in about 2 hours! As usual, Barbara O'Connor's characters are strong and original. The main character, Popeye, is a boy living with his grandmother just waiting for something to happen. For him it's the beginning of summer and he's not looking forward to every day being the same as the one before. Growing up in the middle of a dysfunctional family, absent mother and father, an uncle who gets into trouble over and over, Popeye is being raised by his grandmother, Velma. Velma's big fear is "cracking up" and so she puts herself through mental exercises to keep it from happening. Her favorite is to recite the English royals in chronological order so the story is interrupted time and again by Velma's recitation. Another favorite brain exercise is to work crossword puzzles and so Popeye's vocabulary grows word by word at Velma's insistence. The reader will find periodic words and definitions throughout the book at appropriate places in the story. Outside of Popeye's house, excitement shows up in the form of a family who lives in a big old Holiday Rambler that gets stuck in the lane. Six kids live with their mom and dad, the oldest is Elvis. Popeye is introduced to the kids when he invited to join the "Spit and Swear Club" whose main purpose is to spit and swear, of course. Elvis is an adventurer and is used to a lot less adult supervision than Popeye and so the two decide to have an adventure, a small adventure. This is where Barbara O'Connor hooked me! The boys decide to wander down to the creek to look for an adventure. At first is seems that nothing ever changes until they spot a Yoo Hoo boat, a boat made from a Yoo Hoo chocolate drink box, floating downstream. When they catch it they discover a mysterious note inside and decide they will walk up the stream until they find out who sent the boat. For Elvis this isn't such a big deal, but Popeye has instructions to stay within hollerin' range of Velma, and he fears Velma's wrath, one of the vocabulary words he has learned. I say this is where I was hooked because of the simplicity of the adventure! It's just a stream, in a typical wood, where boys play all of the time, but when a Yoo Hoo boat comes floating by it is transformed into just the small adventure two boys are looking for. It reminded me of my summers growing up when we would take a baseball bat and a flashlight and crawl into the storm sewer tunnel near my house. We would walk for what seemed hours even though we were warned to stay out, and somehow we always ended up at the same place, the corner right next to my house, but it was an adventure. On a recent visit back I noticed they had put chain link over the entrance to the tunnel, spoil sports, so much for adventure! In the end the boys find the source of the boats and the meaning of all of the mysterious clues. I don't want to say too much because I don't want to spoil anything. The simplicity of the story make this an enjoyable quick read and Barbara O'Connor's word choices and descriptions are as strong as ever. She has done it again, a warm, inviting, story that kids are going to love. If you missed it on my earlier post, check out the book trailer here. I was so excited about the book that I already created a mosaic that I won't be able to use for a while but here it is anyway. By the way in response to a question in the comments, Mandy, I don't have a pink bus in my backyard, deed restrictions or something, the pix all came from Flickr. So now, I'm off to Boston...really! It's hard to believe that the start of school is only a little over a month away. OK, I wish I hadn't said that, but it's true and so I have begun a tentative list of things I want to be sure to read in THE PIT to start the year. The list is still very fluid because I know between now and then I'll find a lot more to add to my list. 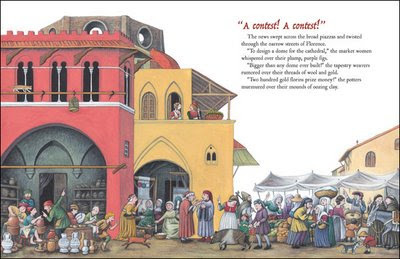 Pippo the Fool is one I'm sure of because of its wonderful story and beautiful, colorful illustrations. Based on the true story of Filippo Brunelleschi, the architect of the dome of Santa Maria del Fiore in Florence, Italy the story is an inspiration to creative types everywhere. 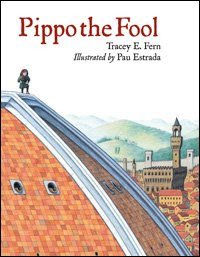 If you're like me, the whole Santa Maria thing may not have meant much to you, and even without any historical background, Pippo the Fool is a special book. The fact that author Tracey E. Fern (cool website) can base such a tale of perseverance on historical fact only serves to make it better. Pippo, like Filippo the actual man the character is based on, is a talented goldsmith and jeweler. He is also a tinkerer and inventor, a mechanic and architect. When a contest to design and build the dome on the cathedral is announced, Pippo decides to enter. Immediately, the town begins to laugh behind his back and the most famous sculptor, Lorenzo, mocks him publicly. Pippo is not discouraged and begins to create a design for the dome that is unlike anything seen before with an interior means of support, and special interlocking bricks to make it even stronger. When all of the ideas are presented, the judges are disappointed in what they see. Even Lorenzo's idea is far fetched and not set in fact only in theory without detail. When Pippo presents his plan without detail for fear of Lorenzo stealing his idea, he is carried out of the cathedral and dropped in the center of the piazza. He decides to show the judges his idea by building it in miniature. When it was finished, the judges were impressed and awarded the prize to Pippo and named Lorenzo his assistant. Of course, Pippo does all of the work to the point of exhaustion and when he needs to rest in bed, Lorenzo is unable to get anything done because he hasn't been there. Pippo works for 16 years until the dome is completed to the joy of the entire city from the market women to the judges. His nickname is changed from Pippo the Fool to Pippo the Genius and everyone has a new found respect for the goldsmith and jeweler, tinkerer and inventor, mechanic and architect. Artist Pau Estrada's artwork is beautiful and compliment the story wonderfully. His rich colors and detailed drawings of the Florence architecture are a joy to study. Kids will find new things in the pictures every time they look at the book. I know this book will be a hit with my students in THE PIT and I can't wait to share it with them...well...ok...maybe I can wait another month or so. By the way, I'm leaving for my second trip to Boston on Thursday with 42 kids and 4 teacher friends so there won't be a new post for a while. 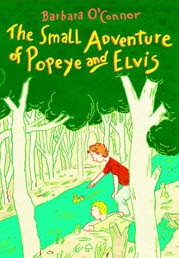 I'm pretty excited today because when I went to my mailbox I found an advance copy of Barbara O'Connor's new book The Small Adventure of Popeye and Elvis. Is that a great title or what!? Hmmmm...I wonder what I'll read first on the bus? 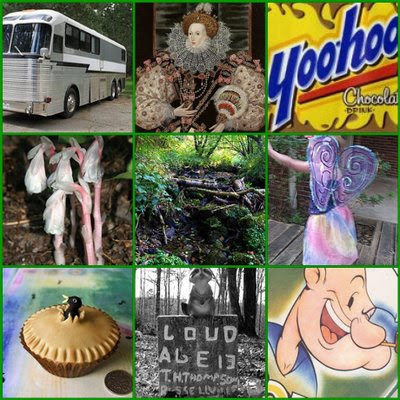 OK, so a while back I posted a mosaic of our trip to Myrtle Beach. I said then I put it together just to see how the program worked and if I thought I would be able to use it with kids. 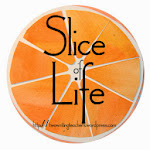 I gave my self several weeks away to see if I could remember the steps and now have created a new one based on one of my favorite books from last year that just happened to win a Newbery Honor. See if you can guess what the book is based on the pictures. This is one of the ways I plan to use this mosaic thing with the kids and I hope to create several more of these puzzles before the summer is over. Then I'll post them on the new SmartBoard in the library and see if they can identify them. Hopefully that will get their attention and some of them will want to create their own for their favorite books too. By the way, welcome to colleagues Lisa and Shelly who kicked off their blog Two Learning Journeys. Two outstanding posts to begin with, I especially like the first with the Flip movie of diving in. Welcome to the pool, ladies! 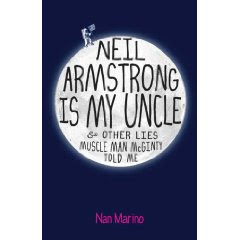 ...and now for a variation on a theme... Neil Armstrong is My Uncle & Other Lies Muscle Man McGinty Told Me is a novel based in July of 1969 that is very well written. Don't let the title fool you, it's not a funny book, though it does have some humorous parts to it, but it is an interesting look at life in 1969. Tamara Ann Simpson is an angry girl. She lost her best friend, a foster child, while she was away, her family is dysfunctional with a brother in college that is a bit of a hippie, a mother who smokes and watches soap operas for extended periods and a father that hates being stuck in the work rut of getting up everyday to catch the 7:11 train. She is surrounded by kids with fairly normal family routines and lives next to the "picture perfect" family that celebrates every occasion with an elaborate theme party that the Simpsons never get invited to. And then Muscle Man McGinty moves into the foster grandma's house and Tamara absolutely cannot stand his bragging and lying, The opening paragraph says it all about her feelings for Muscle Man. Muscle Man McGinty is squirrelly runt, a lying snake, and a pitiful excuse for a ten-year-old. The problem is that no one on Ramble Street knows it but me. In the entire town of Massapequa Park, only I see him for what he really is. A phony. And so, Tamara sets out to reveal what she perceives Muscle Man's true identity to all of the kids of Ramble Street. What ends up happening is that Tamara is the one who is revealed, the unhappiness she lives with eats at her and causes her to be extremely mean to Muscle Man. I like the way that first time author Nan Marino hints at the sadness that Muscle Man McGinty has seen in the first part of the book. I really like the way his tragedy is finally identified. I really like the character of Muscle Man who maintains his sunny outlook on life in the face of great sadness. True, he is a liar that tells some whoppers, including the title, but in the end it's clear that it's his way of coping with the reason he is a foster child. Even though Tamara can't stand Muscle Man it's clear that he is always trying to make her happy and all he wants is for her to be his friend. Nan Marino is librarian who has a really cool website here. It has cool stuff that relates to the book including what's real and what's not, links to some Apollo 11 info, and pix of her with astronaut Buzz Aldin. I have to add this to my Newbery short list, along with another first novel, Also Known as Harper.